"where children are loved and valued"
Here at Channings Nurseries, we are grateful to web promotion partners Oasis Day Care Nursery, for their help in bringing news of our service to a wider range of clients. 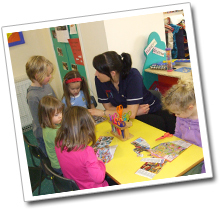 Channings Nurseries provide safe and fun childcare based at three centres in the Oldham and Rochdale areas. Since first opened by Catherine Hoggard [B.A. Hons PGCE] in 1989, Channings has steadily grown into a popular group of childcare nurseries serving families around Oldham, Royton, Newhey and Milnrow. Each of our three nurseries has its own attractive and unique features, while maintaining the high standards which have become associated with our name. The four specific areas of learning are Literacy, Mathematics, understanding of the World and Expressive Arts and Design. Children are constantly learning and gaining experience about the world around them, relationships and self awareness. We are there to help nurture this development in a fun, exciting and safe environment. One of our aims is to realise the potential of every child, and allow the child to build on positive aspects and acquire knowledge and self confidence. The children are able to take an active part in their own learning, by choosing from as range of activities and resources. These choices involve decision making, problem solving and self awareness. Staff interact with children in a way that creates confident verbal communication and expression. At Channings Nurseries, we cater for babies, toddlers and pre-school children, with appropriately tailored rooms, designed with careful attention to detail. Our baby rooms present a bright and stimulating environment, while remaining a cosy home from home. It is extremely important to us at Channings Nurseries to comply with the wishes of each parent when caring for their baby. An initial period of time is spent with parents to help our staff discover your baby's routines and specific needs. This way we can be sure that parents are completely satisfied with our service, and that babies are happy and comfortable. Toys are regularly cleaned and sterilised, and your baby's day will be filled with exploration, stories, talk, messy play, walks, music and hugs. Lively and inquisitive minds are promoted in our tweenie and toddler rooms with an exciting mix of activities such as water and sand play, cutting, sticking, painting, chalking and lots more. 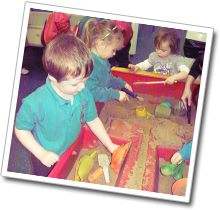 Some form of messy play activity is enjoyed each day, with nursery days developing into learning experiences involving learning through play, language, communication, interaction and social skills. Our pre-school rooms are hives of activity and fun where a child's knowledge and experience can grow. Imaginative play prepares children for life and gives them a safe and fun way to form thoughts, ideas and their own unique character. Toddlers will discover that learning is fun with early reading and maths tasks, construction, baking, ICT, mark making, exercise and dance. At Channings Nurseries the children are able to exercise free choice, within a daily routine which brings an appreciation of structure and an awareness of time. This experience is useful when children progress to school, giving a smooth transition. 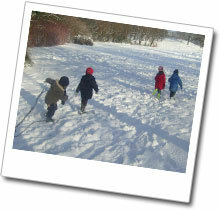 Outdoor play is encouraged and children are taken outdoors to play whatever the weather, dressed suitably of course. One of our main priorities is the safety of the children in our care and any outdoor play is closely monitored by the manager. All of our ground floor rooms are accessible to outdoor play areas, and our buildings have secure coded entry systems ensuring the safety of your child at all times. The staff at all of our nurseries are delighted with the positive feedback they receive from parents and families, some of which can be seen on our testimonials page. Childcare Nurseries for Babies, Toddlers & Pre School Children, Learning Through Play in a Fun & Safe Environment. Activity Filled Child Development from Babies to Pre School, Preparation for a Healthy & Happy Life in Secure & Safe Surroundings. Parent Involvement with all Caring, Learning & Social Skills, Daily All Weather Outdoor Play Encouraged, Oldham, Royton, Rochdale, Newhey, Manchester.